Lovehoney’s Trade Sales Team supported Norwegian retailer Kondomeriet on a series of events. The retailer says the events introduced new customers to the brand Fifty Shades of Grey – the Official Pleasure Products. Kondomeriet stores are located in positions in high footfall areas such as shopping malls and the main High Street in Oslo, and worked on several streams of activity that reported massive amounts of success. Activities included 17,000 Fifty Shades Blindfolds being sent out to 50 cinemas across Norway. Lovehoney’s in-house videography team worked on a dark and atmospheric cinematic trailer, featuring products from the Fifty Shades Darker range which was shown in movie theaters all over Norway. Lovehoney’s designers also worked on an impactful range of POS, designed for Kondemeriet’s stores. 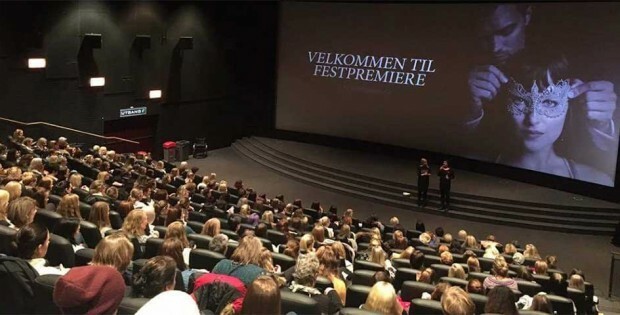 A cinema was hired out for an exclusive screening on the 11 February of the Darker film with 1,500 customers attending, and then revellers went back to the store to purchase the product to the sounds of a private DJ. The staff wore Fifty Shades Darker Masquerade masks. The celebrations did not stop and on the next night there was another, more exclusive party in the Oslo store. Ilona Laboviciute, Trade Sales Executive, Lovehoney commented: “It’s inspiring to hear that Kondemeriet’s exciting events recruited a large number of new customers to experience the new Fifty Shades Darker range. Norway is an exciting market to work with and Norwegians are a massive fan of the Fifty Shades Franchise.This is testament to the fact that this range has opened up pleasure products to a whole new market. We loved working with Kondemeriet and Norway is a fantastic place to visit.” Lovehoney and Kondomeriet are in talks to see what they can work together on for the last movie of the franchise, Fifty Shades Freed.